Pamplin Media Group - HOT or NOT? Portland State University research shows temperature varies sharply from one spot to another in Portland. How hot did you feel over the past few weeks? Aside from the availability of air conditioning, the answer depended in large part on where you live and work. Although the official high temperatures were in the upper 90s, they varied by as much as 20 degrees throughout the city — the difference between being comfortable and sweltering. It's no surprise that the tree-covered neighborhoods in the West Hills are cooler than the asphalt expanses along 82nd Avenue. But Portland State University urban studies professor Vivek Shandas says temperatures in much of Portland are far higher than necessary because of a lack of common-sense building regulations. "There's a lot of room for improvement," says Shandas, research director of PSU's Institute for Sustainable Solutions, which has documented temperature differences within Portland and many other cities. The institute studies how to improve urban environments. 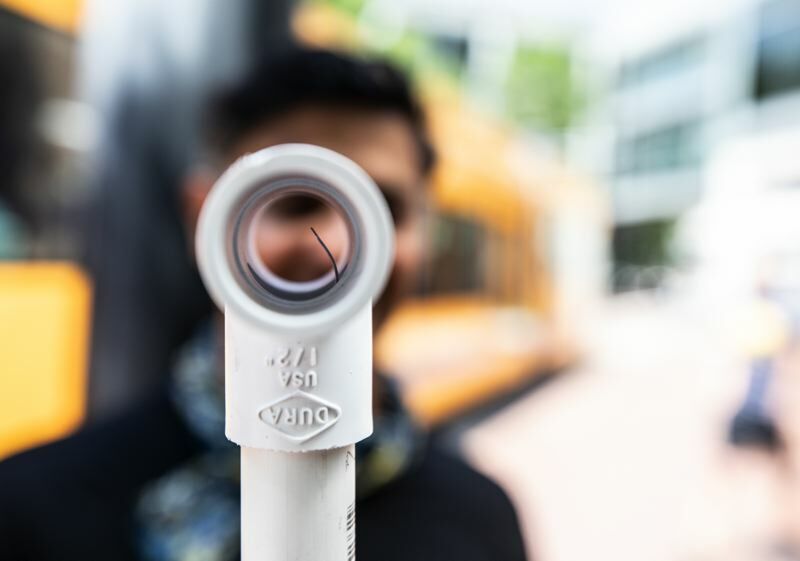 Shandas, students and volunteer researchers have spent years recording and mapping temperatures throughout the city with a device they invented called a thermocouple unit. Constructed with PVC pipe mounted on a 3D-printed plastic base, it houses a sensitive thermometer and data unit capable of recording temperatures every second. The assembly is mounted on the passenger windows of cars that drive through predetermined parts of Portland at 6 a.m., 3 p.m. and 7 p.m. to track daily temperature increases that can be compared to other parts of town. "Each area is designed to be covered at around 35 miles per hour in an hour," Shandas says. The work has produced some unexpected results. For example, downtown is cooler during the afternoon than some less dense parts of town in the afternoons. That's thanks in large part to the shade created by its buildings. "Unlike New York City, we do not have lots of tall buildings bunched together, like in the financial district, which can create 'urban canyons' — areas where the air does not circulate, remains stagnant, and heats up throughout the day," Shandas says. Shandas says he was "particularly surprised by the stark difference between the east and west sides of town, marked by the Willamette River." 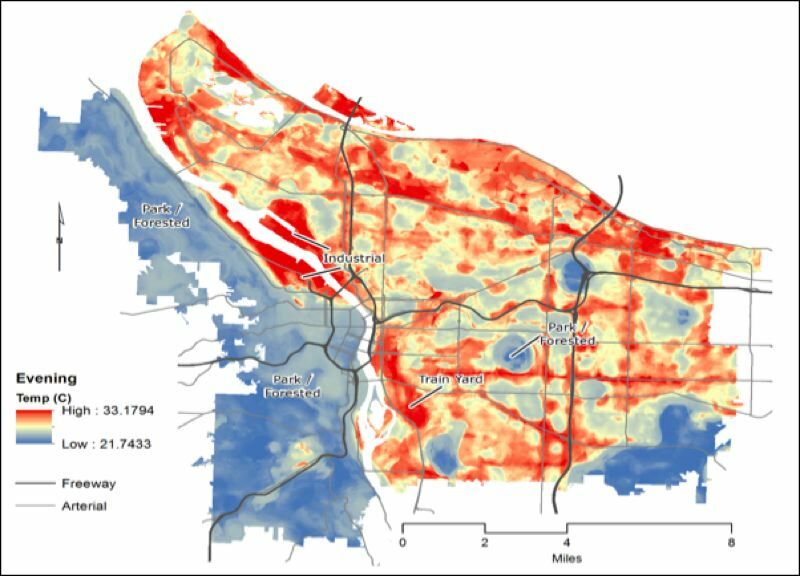 Interactive online maps generated by the institute show some of the highest temperatures are routinely recorded in inner and outer east Portland, including in the Eastside Industrial District, Swan Island and along the Columbia Corridor. Shandas also says that both Powell Butte and Oregon Health & Science University's campus on Marquam Hill get much hotter than expected, given all the trees and open spaces. It's long been known that urban infrastructure — including streets, rail tracks, parking lots, big buildings and freeways — absorb and store heat, which can be released for hours after the sun goes down. History shows that features like street trees, urban parks, white roofs, shade structures and vegetation on exterior walls can help reduce the harmful effects of such "heat islands." More recent research, some conducted by Shandas and his students, shows that designing development projects to increase air circulation between buildings also can reduce temperatures. Based on his research, Shandas says that no jurisdiction in the country has included urban heat-reducing regulations in its construction codes, including Portland. The city could become a leader in the emerging field, though. The PSU institute is working with the Portland Bureau of Planning and Sustainability on an initiative intended to set new standards for large, multifamily housing projects on major transportation corridors in East Portland. The draft Better Housing by Design report includes recommendations to reduce the heat island effects in an appendix titled "Climate Change and Urban Heat." Perhaps the most significant would amend the zoning code to limit surface parking areas to no more than 30 percent of a site's area in multidwelling zones. Other proposed amendments would limit front garages and driveways, require large projects to set aside at least 10 percent of their sites for common areas, require landscaped setbacks between buildings and streets, and allow development rights to be transferred to other sites from properties where large trees are being preserved. "We've spent a lot of time consulting with the staff," Shandas says of the initiative, which is scheduled to be referred to the City Council this fall. Lessons learned could be applied to large projects in other parts of town, like the redevelopment of the Broadway Corridor at the west end of the Broadway Bridge that currently is being master planned by Prosper Portland, formerly known as the Portland Development Commission. Shandas is in early conversations with planners about becoming involved in the project. "We're hoping to be able to show the developers how they can mitigate the heat at the site without raising the cost of the project and provide additional benefits, too, like reducing cooling bills," he says. "No one thing is enough by itself, but if you put them together, you can begin to make a real difference." But as he watches the construction boom sweeping the city, Shandas says he does not see many such design elements in the new apartments and other buildings popping up throughout the city. The same is true in other cities he visited around the country as part of his research in recent years. About the only city doing anything official is Boston, which adopted a voluntary — not mandatory — set of construction recommendations for reducing temperatures around new projects greater than 50,000 square feet. Ignoring the heat island effects of urban developments will have increasingly severe consequences in the future. Shandas and other climate researchers agree that temperatures around the world are trending upward. "With climate change, we expect summer heatwaves to become longer and more intense and frequent," he says. High temperature records around the world have been shattered this summer, with hundreds of heat-related deaths documented in countries such as Canada, Japan and Pakistan. One result has been a wave of recent news stories about the heat island effect in such cities as Atlanta, Baltimore, Dallas, New York, Phoenix and Washington, D.C. But as Shandas and his researchers have shown, high temperatures can vary greatly within cities, too. In Portland, researchers found that on a typical summer day, the average citywide temperature ranges from 78 to 85 degrees. But within the city, temperatures can vary by 10 to 13 degrees each day, depending on location. And on 90 degree-plus days, temperatures in Portland can vary by 16 to 20 degrees. Joking that he has become a "heat wave chaser," Shandas has conducted his research in other cities, too, stretching from Albuquerque, New Mexico, to Surrey, British Columbia. By lending the thermocouple units to trained volunteers in these cities, they've been able to document the same kind of temperature ranges as in Portland, helping spark discussions about what can be done to reduce the temperatures in the hottest areas. "There's tremendous interest in these communities," Shandas says. "Showing that development patterns can lower temperatures is a helpful message." • To learn more about Portland State University's Institute for Sustainable Solutions, go to www.tinyurl.com/y89j83v5. • To view the interactive Portland temperature maps, go to www.tinyurl.com/yaghx3gl. A Canopy Story sponsored by the U.S. Forest Service includes the location of large trees and allows people to tell stories about their neighborhoods.